Address: 78 Horne Rd, Singapore 209078. 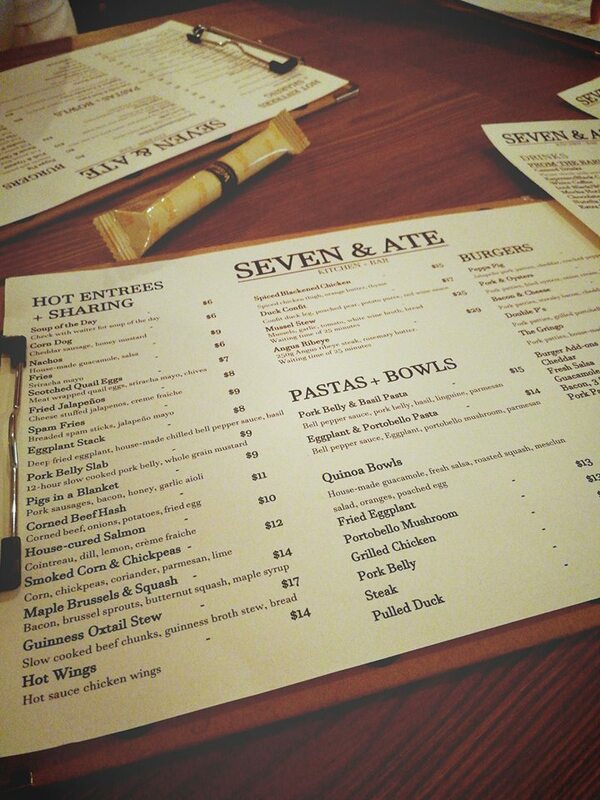 Seven & Ate is a new cafe which replaced the Bao Makers, which is located near by the Lavender MRT station. Along this road, there are several cafes to hop if you around there for the whole day. I visited the cafe along with three other colleagues on the Friday’s evening after work. It was the Chinese Valentine’s Day which is also known as Chap Goh Mei in Cantonese. On this eventful day, normally the Chinese single ladies will head to the river with the mandarin oranges to throw them into the river. It is said the right man who pick up the mandarin orange will find the lady and their relationship will blossom. Unfortunately, in Singapore, I think if we were to throw the mandarin oranges into the Singapore River, the next thing we would get was a summon from the police officers, not a Mr. Right. The waitress told us this was their new menu and plenty of the food from the menu are sold out. I was wondering how nice was it until some of them sold out. One of the food on the menu which remained same was the Pork and Oyster Burger. I googled for this burger reviews as I tried it with having done my research. They say the burger comes with Honey Mustard Pork Patties, Fried Oysters, Onion Sour Cream and BBQ Sauce in between two buns. Well, the pork patties were really juicy and the fried oysters were crispy and fresh. 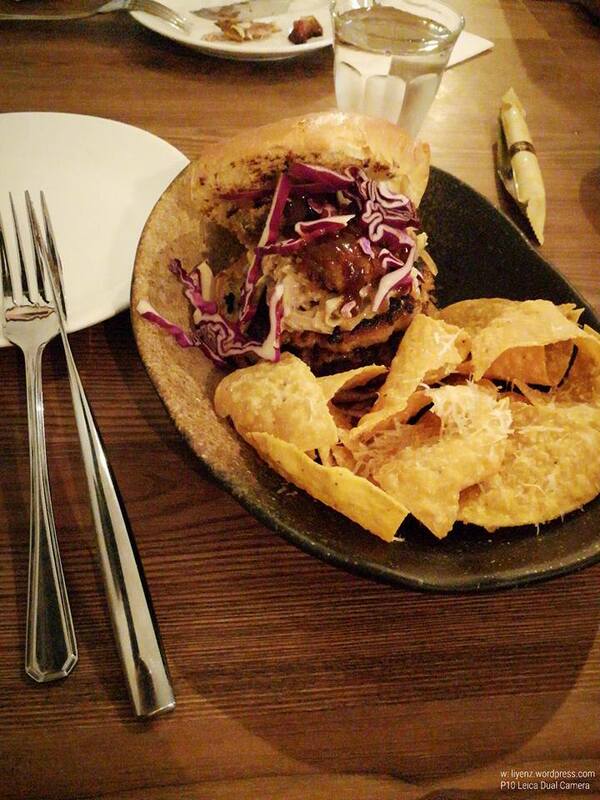 The burger bun was soft but crispy from the outside. It came with the nacho chips served on the side. 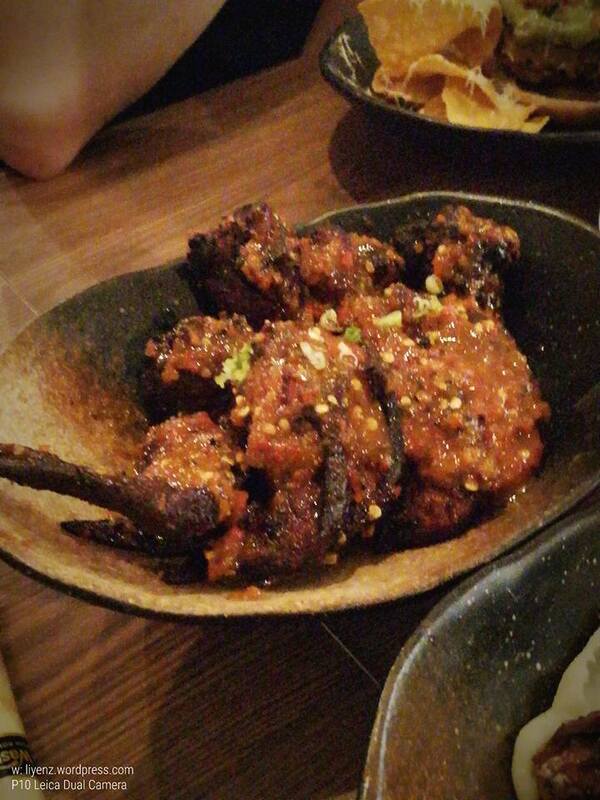 Next, my colleague ordered the Spiced Blackened Chicken. It was nicely presented with garlic and sliced orange. 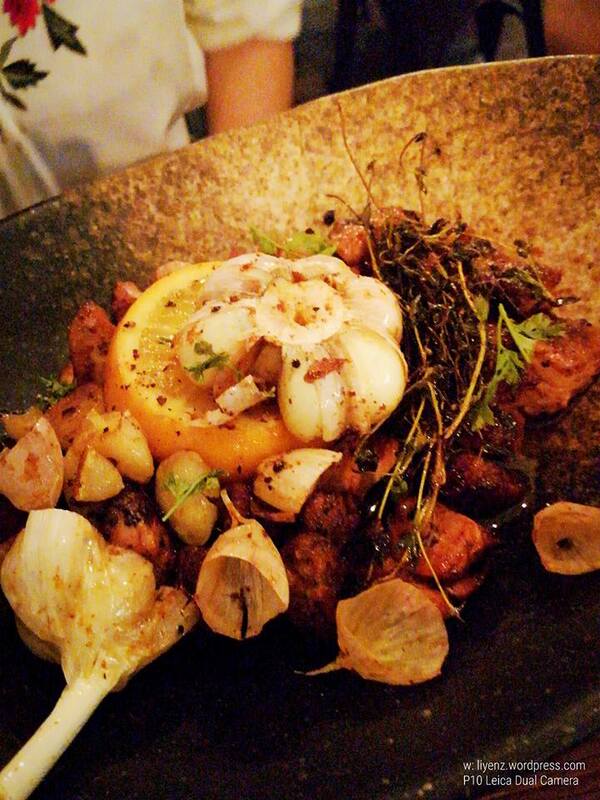 Perhaps, it called blackened chicken, the chicken meat was grilled slightly darker but it was not too dry. 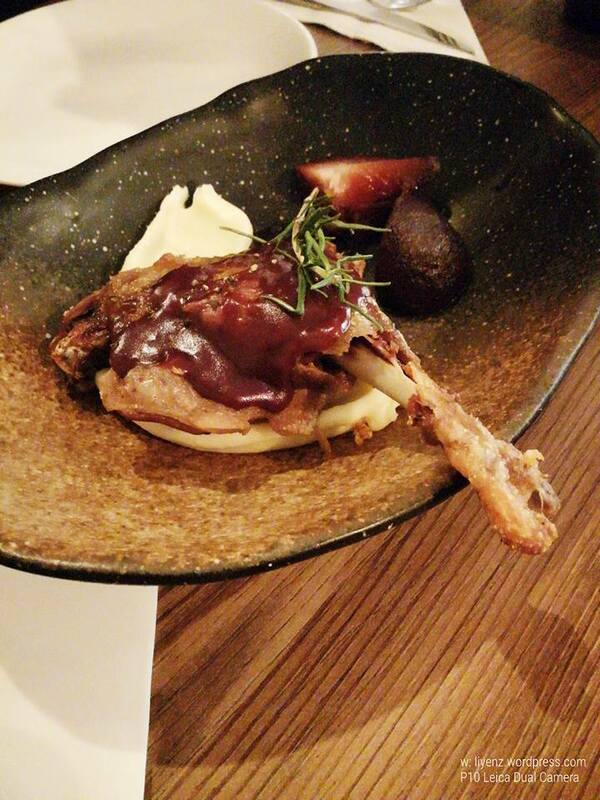 Next, I tried a small bite of the Duck Confit served with red wine sauce and red wine poached pear. It was soft and delicious, just that it looked quite small portion. Lastly, it was the Hot Wings. I has about six wings with the chili paste spreaded across the wings. I did not try them, however, my colleagues said it was spicy. Overall, the food is quite nice presentation, plenty of rooms for improvement if they want to change their menu again next time. The ambiance of the cafe is a little a bit noisy since it is a drinking place too. It is not spacious, probably cannot hold a big group of people. The cafe is decorated with old musical pictures and several instruments, so I am hoping to see a live band in the future with small groups of people enjoying the night.